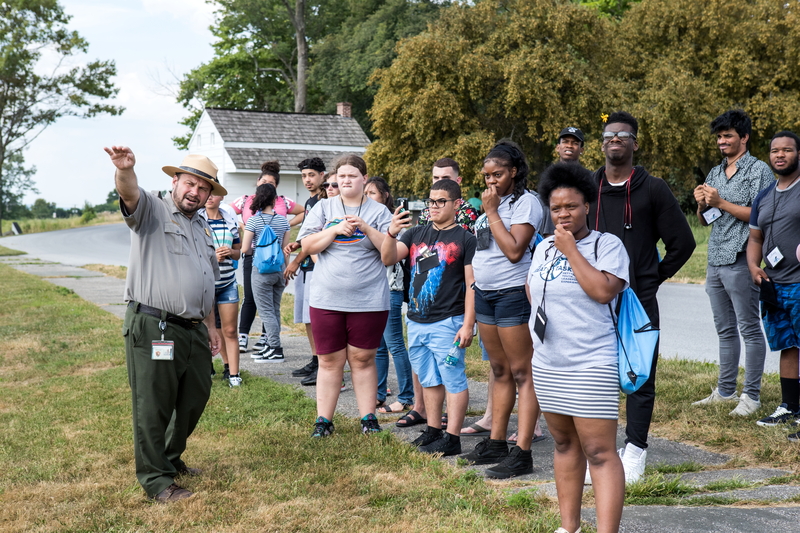 Within just 10 sentences of Abraham Lincoln’s “The Gettysburg Address,” Barbara Sanders found inspiration to develop a unique program that challenges youth to reconnect with their past to change their future. Sanders, an education specialist at Gettysburg National Military Park, and her staff created the “Great Task” Youth Programs in Community Service and Leadership based on Lincoln’s Nov. 19, 1863, message asking Americans to focus on “the great task remaining before us.” The two-and-a-half-day programs run from July to October and are open to school-based and youth-oriented groups that serve late middle school and early high school students. Sanders explains that the learning here on the Gettysburg battlefield centers around group-oriented, application-based tasks. The program consists of three parts—two activities completed as a group on the battlefield, a group service project done on the battlefield, and a service project the group performs in its community after the program. The lessons focus on 12 character traits displayed during and after the Battle of Gettysburg that are also relevant for leaders today: discipline, teamwork, courage, integrity, endurance, strategic thinking, overcoming adversity, sound judgment, problem-solving, leadership, duty, and sacrifice. The key element that sets this program apart, Sanders says, is the way the students experience the battlefield during the program. Upon arrival in Gettysburg, the students tour the museum, view the movie about the battle, and visit the cyclorama to get a sense of place. Then, each student is given an identity card featuring a short biography of a person who witnessed or had close ties to the battle and their character traits. The identity card, Sanders says, effectively narrows the students’ experiences on the battlefield to one singular point of view. That point of view and those character traits become the focus of the group discussions held after the activities on the battlefield. For example, after setting up the field hospital and creating an operating table with two saw horses and a barn door at the Weikert Farm on United States Avenue, the students talk about Matilda “Tillie” Pierce, a 15 year old who, without training, became a nurse during the war. They discuss integrity and how Tillie would have treated both Union and Confederate soldiers equally. Then, they explore how integrity might come into play during their service project. Sanders shares another example: after learning how to load and fire a canon on the 9th Massachusetts battalion line, the students talk about Basil Biggs, a free African-American who made the decision to move his family out of harm’s way, and the endurance he would later need to help to bury the dead left behind after the battle. Endurance can become a key factor in completing a service project that takes more energy and time than a group anticipates. The on-site, short-term service project is a new addition this year to give students the opportunity to participate in a project and discuss it after completion. Sanders says students will be working closely with the Park’s Adopt-A-Position program to build a portion of a Virginia rail fence. At the end of the program, the students gather at several of the gravesites in the National Cemetery and read letters from the buried soldiers. There, the traits they talk about here are duty, sacrifice, and leadership. The program is now in its second year. Nine groups, including the Boys and Girls Club of Metro Richmond, the New York City Police Athletic League, the Gettysburg Civil Air Patrol, and the Edgar Fahs Smith STEAM Academy of York, participated in 2017. Lodging and meals for the 300-plus students were paid for by an endowment from the Robert H. Smith Family Foundation through the Gettysburg Foundation. Jan Martin, STEAM Academy coordinator, is impressed with how receptive the students were to the ideals of the program. Upon their return to school, her 24 students developed and completed three service projects: heritage interviews with the residents at Autumn House West and dioramas based on the interviewees’ countries, an indoor carnival of STEAM experiences for foster care families from PA Child, and volunteering at the York Cares Resource Fair. Based on its participation in last year’s program, the STEAM Academy received a $500 grant from the Great Task program to use as seed money for a community service project. Now we are engaged in a great civil war, testing whether that nation, or any nation so conceived and so dedicated, can long endure. We are met on a great battlefield of that war. We have come to dedicate a portion of that field, as a final resting place for those who here gave their lives that that nation might live. It is altogether fitting and proper that we should do this. But, in a larger sense, we cannot dedicate—we cannot consecrate—we cannot hallow—this ground. The brave men, living and dead, who struggled here, have consecrated it, far above our poor power to add or detract. The world will little note, nor long remember what we say here, but it can never forget what they did here. It is for us the living, rather, to be dedicated here to the unfinished work which they who fought here have thus far so nobly advanced.